And now I need one. As I mentioned a week or two ago, I’ve been giving serious thought to a BRZ as a second car. I had the day free, so I decided to go to a nearby Subaru dealer and test drive one. The one I drove was a 2014 with 11,000 miles on the clock. Took a good look around the car before getting in. That front lip on the bottom edge of the bumper is begging to be bumped into curbs when pulling into parking spaces. I admit I’ve been spoiled by the Outback and not having to think about those things, because the bumper will always clear it. The trunk, which I expected to be small, was even smaller than I expected. The car is so low that fitting the trunk with a spare tire means the cargo area floor resting on top of the spare is high up, leaving little vertical room. Got in the car and initial impressions were very good. The seats were comfortable, with good bolstering that made me feel secure without having any of it pushing against me the wrong way. The steering wheel was in just the right position, as was the shifter. My knees were a bit closer to the dashboard than I would have liked, but I think I could fix that if I had time to fiddle with the seat more (lowering it would probably help). Back seats are definitely seats in name only and not function. The seatbacks of the front seats were pushed firmly against the edge of the rear seats. In reality those seats are just well-bolstered shelves. Finally, time to drive. I took a moment to feel out the shifter and find the clutch engagement point. The lateral (side to side) space between the gears is probably half what I’m used to in the Outback. I could totally see myself going into third when I want fifth. When we set off I gave the throttle a few feather blips (yes, I’m one of those). It took more pressure/time to get the engine to respond with revs than I’m used to, which I didn’t expect. From the dealership we first went onto the highway, and I immediately understood why some people complain about these cars not having enough power. Acceleration was steady, but by no means swift or forceful. My Outback, with its larger than stock turbo and injectors, definitely gives a firmer shove to the backside than the BRZ does. When I had to accelerate around slower traffic I learned I needed to drop it two gears, not just one. When it’s go time the engine is happiest north of 4,500 rpm, definitely not a torquey motor. The car still has enough to get out of it’s own way though, and I’m not looking for my second car to be a power car. The speedometer kept throwing me when I looked at it. The numbers are small, almost unreasonably so, 0 mph is around the 4-5 o’clock position (as opposed to the 7-8 o’clock that most cars use), and on a speedometer that goes up to 160 (lol) you’re outside the “legal speeds” range (and into “Virginia jail” territory) before the needle even goes horizontal. I kept looking at the gauge, seeing where the needle was, and thinking I was going a good 30-40 mph slower than I really was due to its position and the speeds I’m used to seeing correspond with that position. There’s a digital speed readout in the tachometer gauge on the dash, and eventually I’d get used to looking at that, but there would definitely be some mental confusion for the first few weeks. We got off the highway and the salesman directed me to some twisty backroads he knew of, and this is where the car sold itself. The car’s handling and responsiveness was almost psychic. Nailing the apexes in the rapid succession of corners was effortless, and the ability to get back on the power on the way out of the corners was excellent. This was exactly what I was looking for, something that could be hustled swiftly but comfortably. Even the Prius tires were better than I expected, providing more than enough grip for a spirited test drive and letting you audibly know when they were approaching their limits so you knew not to push much further. The pedals were also spaced perfectly for my bigass feet (size 13). One of the things I love most about my Outback (and hate about my brother’s Focus) is the pedal placement. In the Outback the gas and brake are positioned perfectly to allow a bit of foot overlap between the two pedals so that I can use the right edge of my foot to blip the throttle on downshifts. It does get a little tight in there when trying to left foot brake though, with my wider running shoes struggling to be crammed between my left foot on the brake and the transmission tunnel (switch to my Pumas and this problem disappears), all in part because my left foot needs to be towards the right on the brake so it’s not catching the clutch. In the BRZ this isn’t a problem. The whole pedal box has a bit more room between it and the transmission tunnel, and the space between the brake and the clutch is nearly double that of the Outback. I suspect there’s an extra milimeter or three between the gas and the brake as well. All in all this meant it was easy to switch from braking (and blipshifting) with my right foot while clutching to left foot braking for the next corner that didn’t require shifting. Speaking of shifting, good transmission. Good feel, good short throws, very comfortable to use. Sixth gear did have a little more resistance to it than the others when trying to engage it, but it was barely noticeable. Got back to the dealership and tested rear visibility by backing it into a parking space. The 2014 doesn’t have a back up camera, which I admit I kind of wished it did at that moment, but visibility was still better than expected. I did end up overestimating how much car was behind me and stopped about 20 inches from the rear of the parking space. Another thing that would be fixed with time. All in all I was very happy and very impressed. All the concerns I had about the car going in proved to be negligible. Visibility, seat comfort, the ride over rougher roads (which was firm to be sure, but well within my range of acceptability). There are a few little things I didn’t like and things I’ll miss. For starters, the key is one of those proximity keys. I’m one of those dinosaurs who likes a real, physical key that you need to insert an turn, because then you always know exactly where the key is. I don’t know if there’s such thing as a BRZ that uses a physical key, but if so I want that one. Secondly, instead of a 12V outlet at the base of the center stack there’s a USB/AUX input. In the Outback that’s where I plug in the dash camera so I can run the cord under the dash and up the A pillar. Putting a dashcam in this car will take a bit more work. Speaking of the center stack, the climate control system isn’t well labeled at all, figuring out how to adjust the fan speed took a little trial and error. I didn’t get to play with the entertainment system, but my experiences with touch screen setups have definitely been hit or miss, hopefully this one is a hit. I’m going to have to figure out where to put my phone when using it for Waze/music (in the Outback I can actually pop it into the cubby where the optional satnav goes, and it fits so perfectly it almost looks factory), and I’m going to miss having radio controls on the steering wheel. I’m also going to miss having heated seats and heated side mirrors, but this won’t be the winter car anyway, so that shouldn’t be too massive of an issue. As an additional note, the salesman who was with me (Michael from Suburban Subaru in Vernon) was awesome. Throughout the entire visit he was friendly, pleasant, and never pushy. He was a muscle car guy who was still learning Subarus and openly admitted whenever conversation got into anything he didn’t know about. He (of course) asked me about my purchasing timeframe, and I told him it was probably going to be around a year because I intend to pay off my other debts first so I can focus entirely on the car payments when the time comes. Instead of losing interest in me at that point or getting pushy he said he understood and thought I was doing things the intelligent way, and continued to let me explore the car. We chatted about cars and rally, and how a lot of the kids that show up at rallies are the same kids he gets trying to joyride STIs. When he led me to the twisty roads (which he clearly doesn’t show to everyone), he said “I know you’re going to enjoy these roads, and so am I!” His manager did get a little push on at the end (“Are you sure there isn’t anything I can do to make a deal?”) but Michael was awesome from start to finish. I gave him $30 so he at least got something for the time and attention he gave me. Hopefully when I’m ready they’ll have something so I can buy a car from him. 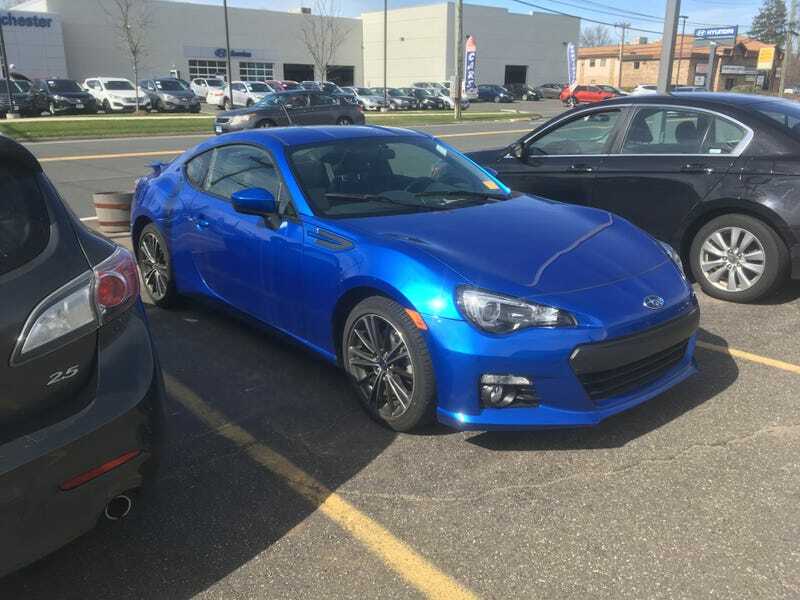 Two questions I have for any BRZ owners after the test drive. First, the engine note was louder and more present than I expected, which was a pleasant surprise. Is it pumped in electronically or is that genuine? Second, does the car take regular or Premium?